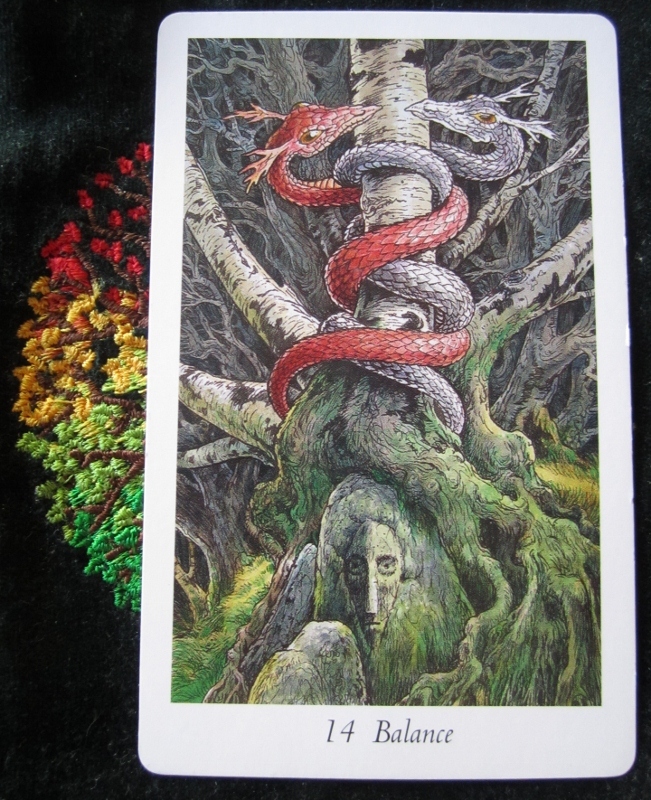 Today’s Card of the Day is from the Major Arcana and in this deck, is Balance. In RWS, it’s Temperance but the Wildwood has a more down to earth, approachable. 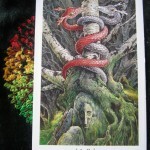 As you can see, there are two serpents, one red, one white, twisting around the trunk of a silver birch. I questioned the use of the Silver Birch in these cards to John Matthews. To me, they’re from Europe and not a native British Tree. I was told, simply and nicely, that I was wrong, that these trees are as ancient in Britain as the Oaks are. So, at the 2011 TABI Conference, I learnt more about this wonderful deck. But what of this cards meaning to us today, centuries later? John and Mark indicate that this tree is a staff, sent from the Heavens, polarising the white of the milk, ash and bone with the red of blood, fire and iron. The card itself shows us a light and dark side. There are many ways this can manifest in a day, from the helpful shop assistant in a local supermarket, to the dark of a tantrum from a toddler, to the light of day and the dark of night. We, as a human race, need to balance our dark side (wants, material needs) with the light of needs and returning to mother nature that which we do not need, but have taken. Try teaching that to two little boys!